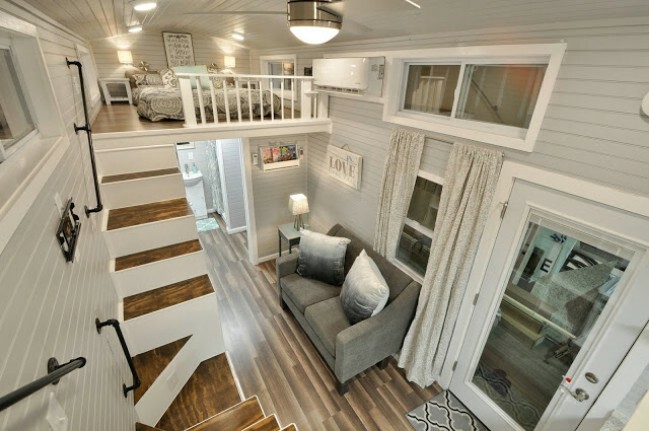 The virginia-based company, Tiny House Building Company, LLC, has released a simple yet gorgeous tiny house called Kate that we can’t get enough of! 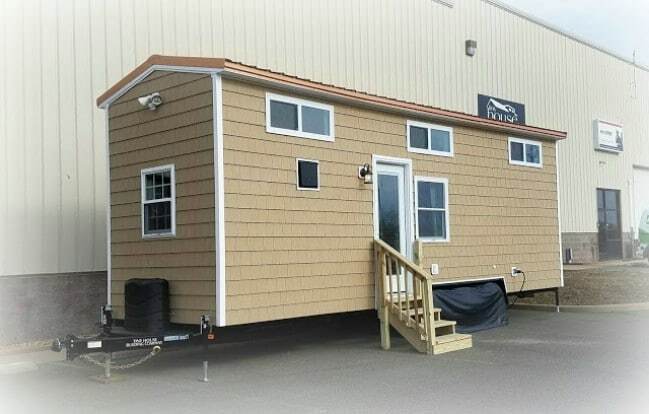 From the outside, you may think this is just another cedar-shake covered boxy tiny house, but you’d be wrong! The inside of this house is unbelievable which is why this lovely lady fetches a price tag of $85,000! Now, before you tune out, that price includes a fully furnished, move-in ready home with tons of upgrades and high-end finishes. You also have a copper roof and a custom glass door with built-in mini blinds which are perfect for traveling. Inside, it’s easy to see why this model is priced higher than some others. 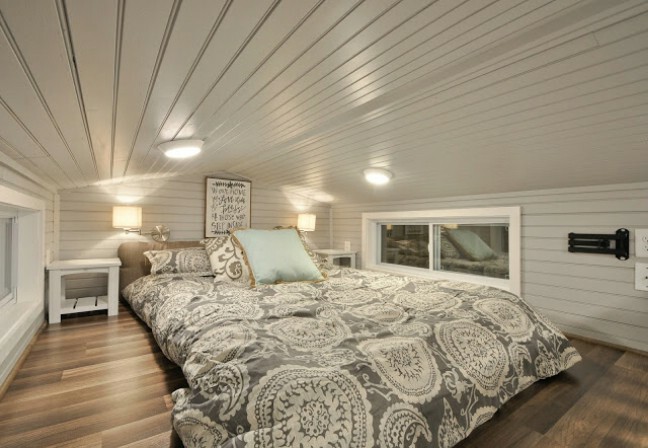 The walls are covered in tongue-and-groove siding and the hardwood floors are made from high-end materials. 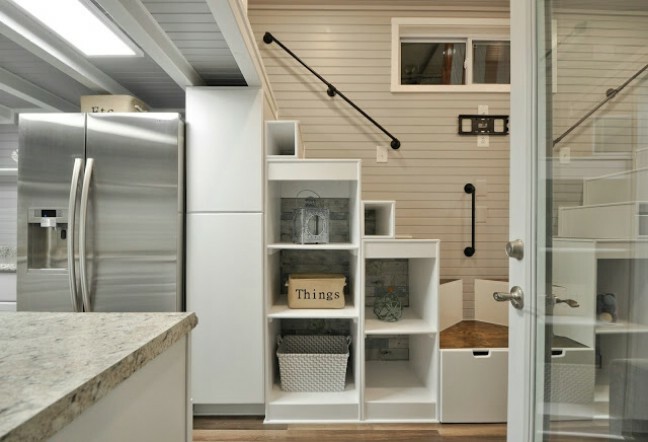 A custom staircase is the first thing that you notice inside and it doubles as an attractive storage system with cubbies and drawers in each step. 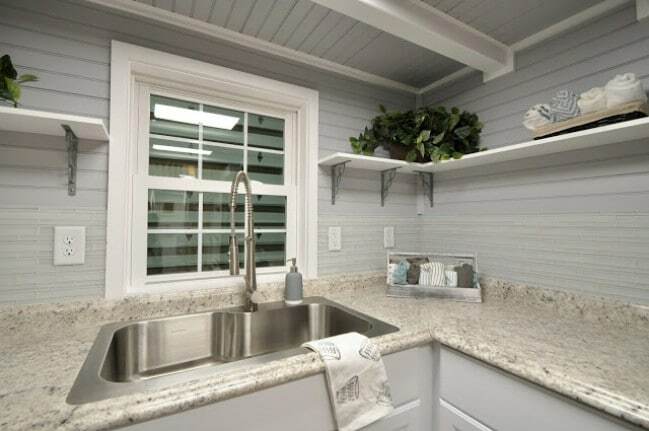 The kitchen has granite countertops and stainless-steel appliances as well as a floating shelf which lines the perimeter of the room. 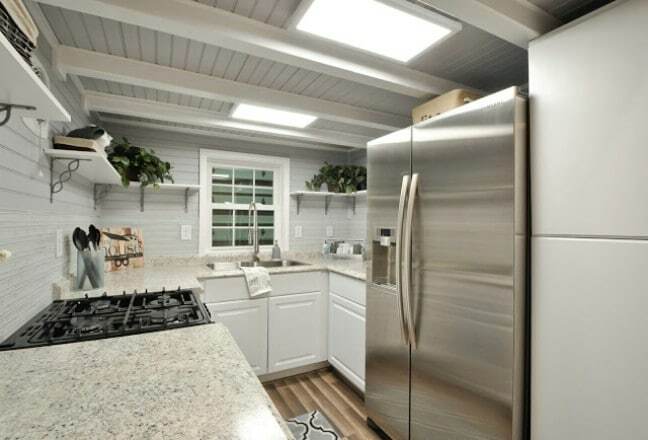 A full-sized double-door stainless-steel refrigerator and a four-burner cooktop make this a gourmet kitchen fit for any chef. 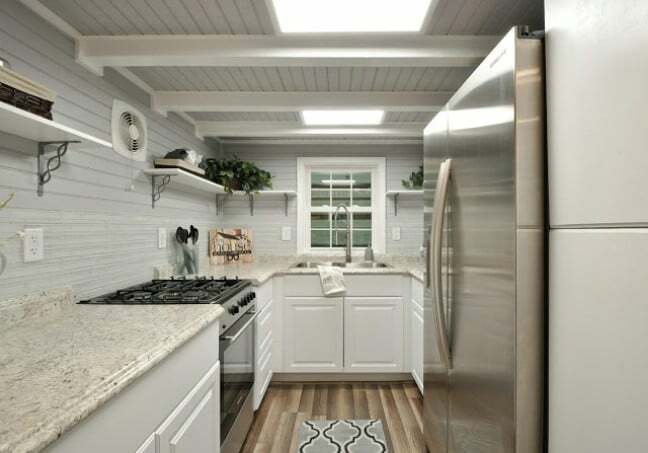 The small kitchen feels large thanks to the cross beams on the ceiling and light color scheme. The living room is between the kitchen and bathroom and has a small couch across from one of three TVs in the house. A sleek ceiling fan keeps the whole house cool and circulates fresh air so the lofts don’t get stuffy. 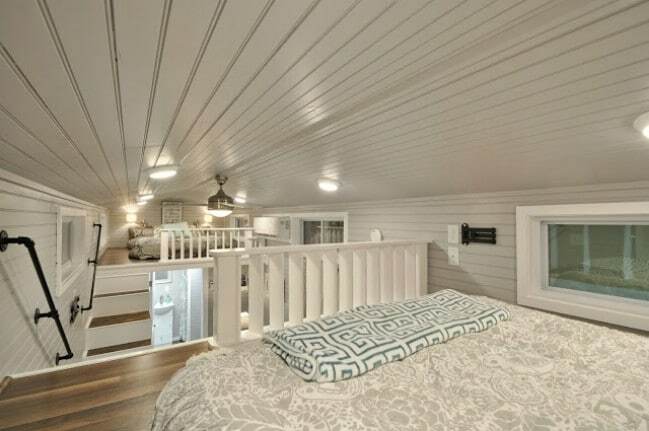 Kate has two lofts each of which are a good size for a large bed and nightstands. The rooms have long windows which let natural light and fresh air flow in when desired or you can light the area with the recessed lighting or wall sconces. The home has a clean line of sight from one end to the other which makes the house feel spacious and open despite its smaller size. Also, by having the flooring point in the direction of the end of the home, it keeps your eye moving and makes the rooms feel connected. 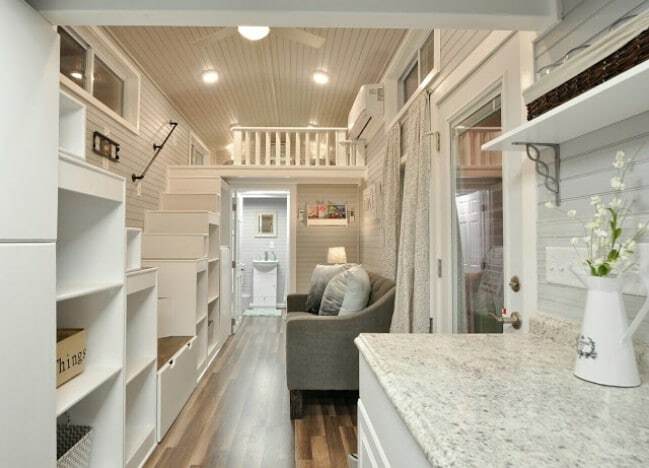 As you can see, this tiny house feels huge and has plenty of room for a family or for guests. 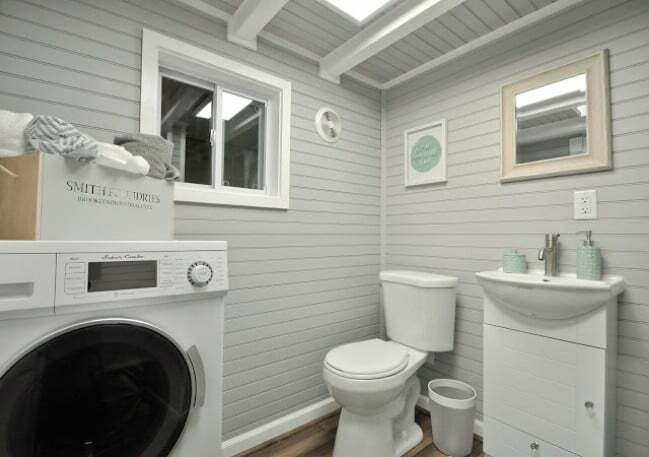 The bathroom features a full-sized toilet and a slim sink and vanity which leaves room for a washer and dryer combo in the same space. 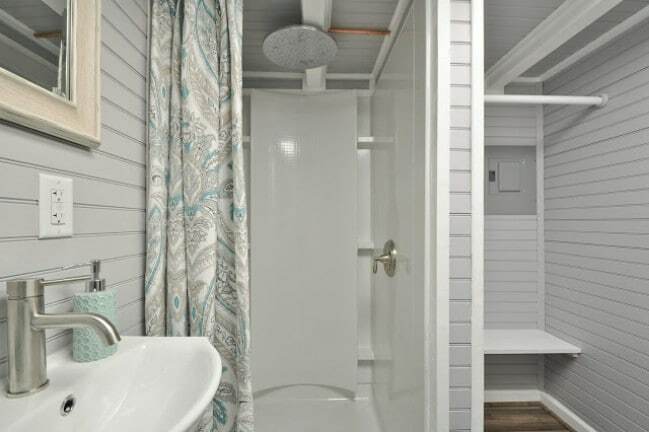 Also in the bathroom is a luxurious shower with a rain showerhead. 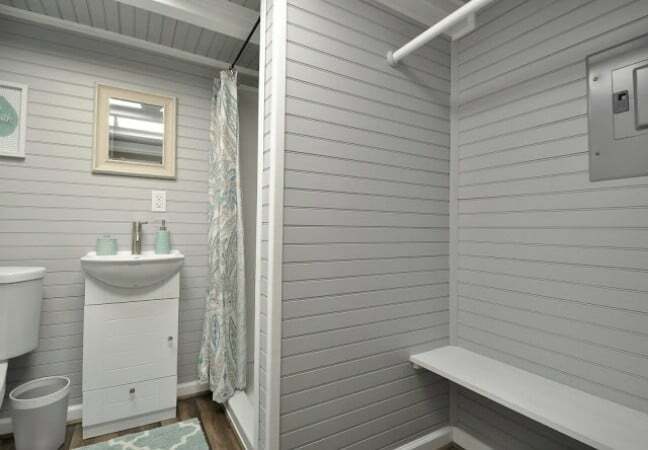 A closet was also installed next to the shower for hanging clothes. This is just another area of the house which seems larger than what you’d normally find in a tiny house! 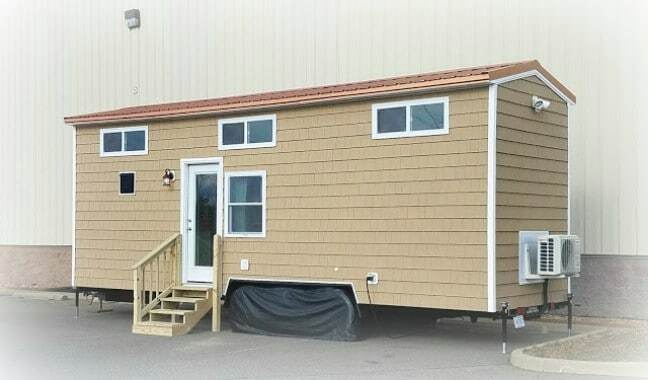 If you’re interested in the Kate and want to see more pictures and learn about her many attributes, check her out at http://tinyhousebuildingcompany.com/kate-tiny-house/. 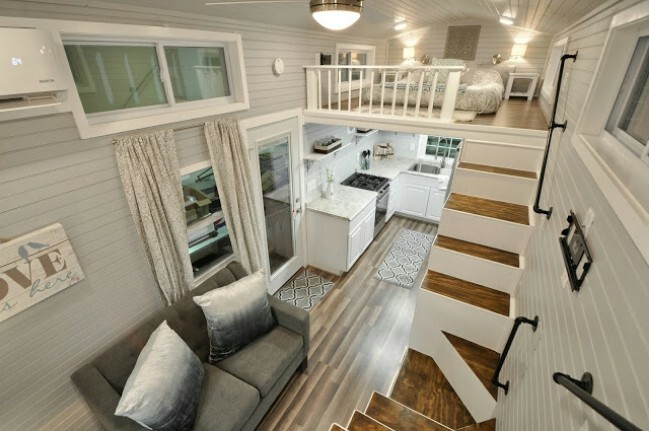 I Love this tiny house the best thing ever. 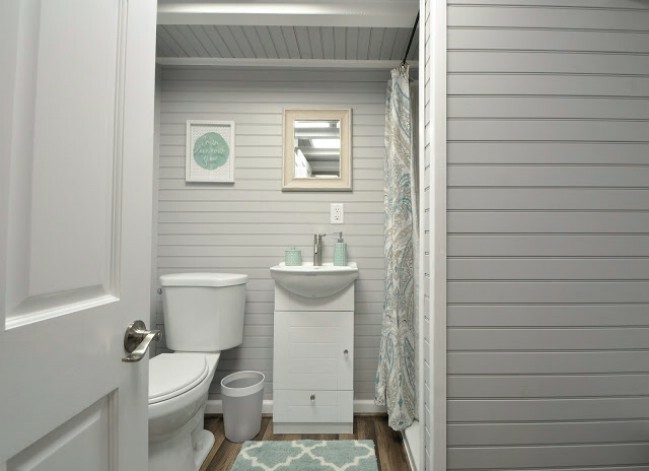 I hate to see the bathrooms right next to the kitchen and this is totally not that love love love that idea that you made. Although I do not like having a loved due to my age it is still a good idea I like the railings to go up the loft . 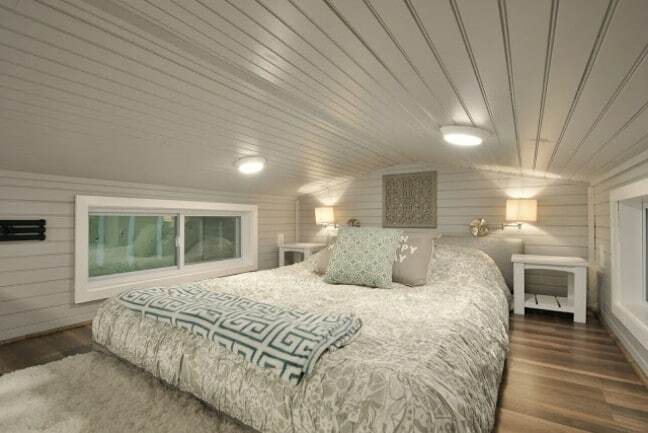 Thank you so much for this beautiful home I wish it didn’t cost as much I would love to buy one really and truly I have been looking and looking to buy a small home for myself since my husband passed away. 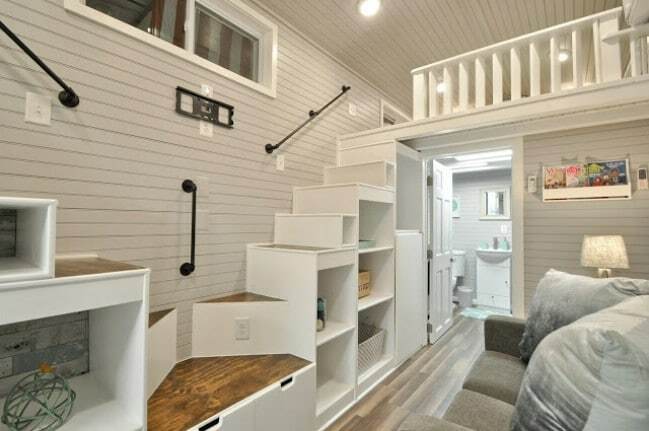 I would appreciate getting informations as many as possible about tiny houses you built or build, prices, delivering costs, architectural possibilities etc.